Having plants in your home can be a joy. Whether you like them for their aesthetic quality, or their smell, or just like to have nature close to you, plants can really improve a living space. However, many of us don’t have room in our small apartment or house to fill it with freshly cut flowers, bonsai trees, or huge plant pots. Luckily, there’s a quirky and cool way to grow your plants without taking up the last available floor space. All you need to do is know how to make a terrarium. 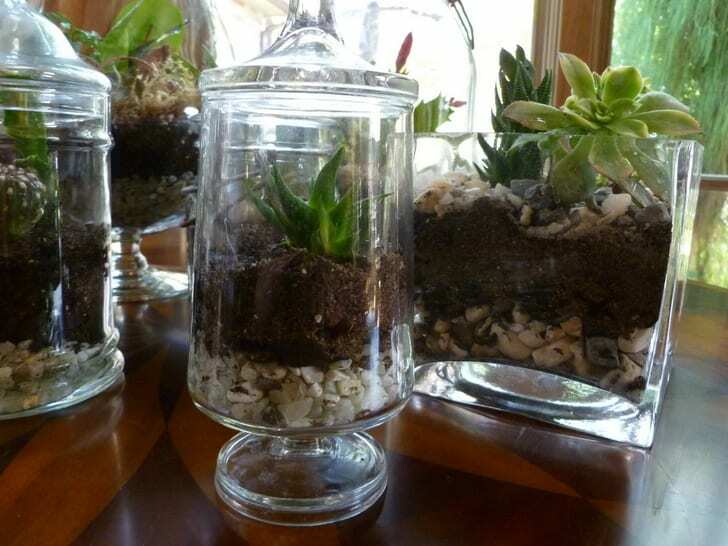 Making a terrarium is surprisingly easy – and pretty fun to do at the same time! First and foremost, you’ll need a terrarium container. This part is completely up to you. 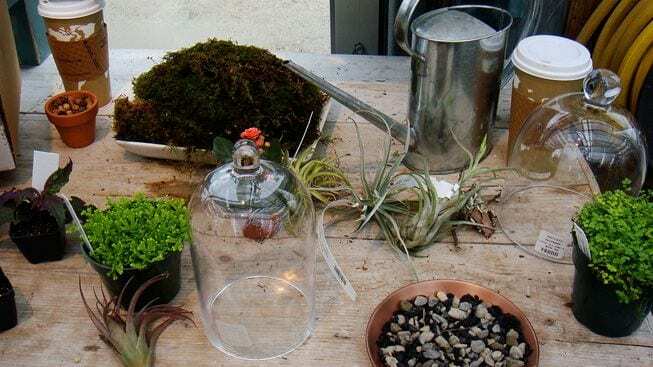 Many stores offer proper, hand-blown terrariums that are of high quality, but you can also DIY your own terrarium. As long as the glass is sturdy and it’s big enough for what you want, you could even use an old fish bowl. You can make the container as wacky and as quirky as possible. You’ll also need to buy a variety of sand and rocks. The sand works as a base for the plants to grow, but it also there to look pretty, so make sure you work out a color scheme. The rocks can also be all shapes and sizes. However, you will need smaller, gravel-style stones to act as drainage. Of course, the most important materials you’ll need to make your own terrarium are soil and the plants themselves. 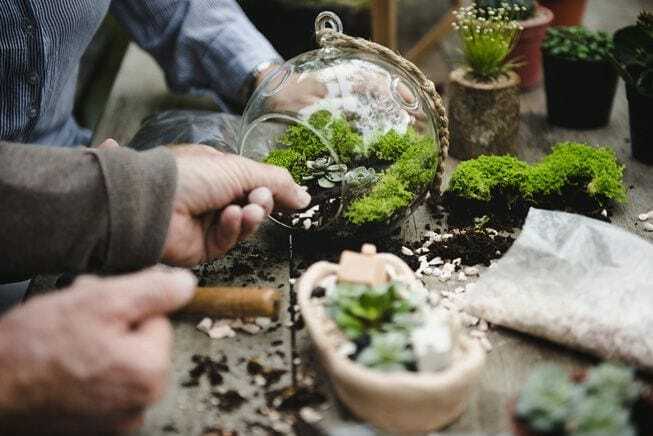 To make your terrarium, you’ll first need to grab your empty terrarium container and add the smaller gravel-style stones to coat the bottom of the pot. This will act as drainage and catch the water when you water your plants, which you’ll need to do regularly to ensure they stay alive and healthy. Next, you’ll need to grab your sand and pour it on top of the gravel. When doing this, it’s important to look where you are pouring the sand. If you simply pour and continue on, you may have a lopsided sand layer. If this is the aesthetic you are going for, you can carry on. If not, you may want to spread out the sand with a spoon or your hand to ensure it looks nice from the outside. Now you’ve got your first two layers; you’ll need to add the next layer – soil. The soil layer will be your thickest layer in your terrarium, and you’ll need to ensure that the soil is thick enough to fully plant your plants and their roots. Once you have poured in the soil, make holes in it so you can easily insert your plants. If you have different sized plants, make sure you plant the biggest first and work around that as a starting point. However, it is important to remember plants need space to grow, so do not overpack your terrarium. Now, step back and look how pretty your new terrarium is! Remember, the work doesn’t end when you’ve finished your terrarium, as it will need maintenance. Most terrariums will need to be watered once or twice a week, but it is recommended that you spray them daily with a mist-spray as this provides the humidity that plants love. You’ll also need to keep an eye on your terrarium to ensure that none of the plants are rotting or getting too big for the pot. If they are, you can prune back the dead areas or cut them back completely. For your terrarium to flourish, it is best to keep it in natural and indirect sunlight. Now you know how to make your own terrarium, it’s time to get started!